The semiconductor industry is at a major inflection point Intel's CEO Paul Otellini predicted today at the company's analyst day, with the increasing cost of manufacturing causing a shake-out among the biggest chip players that, he said, would only leave two or three companies at the leading edge of chip design. Intel veteran Gordon Moore had predicted a thinning out of chip fabrication facilities once the cost of a new 200mm wafer manufacturing plant hit $1bn, but he'd been a little too early, Otellini said. The reduction in the industry is beginning now with the cost of 300mm wafer manufacturing plants hitting $5bn he said, and the situation will accelerate with the launch of 450mm wafer fabs that would cost upwards of $10bn apiece. Such expensive facilities needed steady orders to be profitable and only a few companies, Intel included, could manage such consistent volumes - with Samsung likely to make it too. This move would be intensified by the changes needed in designs and materials needed to build the next generation of computing chips. The move to production of Tri-gate technology has taken 10 years to develop, he said, and not many people could afford the R&D costs. Chip etchers without access to this kind of research would be forced into production of lower-spec, cheaper chips. Otellini also had words of warning for ARM, Power, Sparc, or any other RISC chip and anyone else with a different architecture looking to cut into Chipzilla's markets. Intel has boosted Atom development to double Moore's Law and the latest z2460 smartphone chips were getting good reviews and would move to 22nm transistors next year, with Intel aiming to be a leader in ARM's core market. As for Windows 8 on non-Intel systems, Otellini warned that ARM is in for a rude awakening. "ARM has a big uphill fight against what we're going to do – we have incumbency, legacy support, and the capabilities of Intel for scale and power," Otellini said. "Critically for CIOs, and also end users, is that drivers are just going to work. There will be some compatibility challenges for other architectures." RISC processors are also in Intel's sights, with a push into the communications systems market with the latest Xeon processors. Communications vendors were moving away from proprietary RISC-based systems and Xeon was ideally situated to offer a more open architecture, Otellini claimed. As is usual, an IT vendor is claiming that something that is pervasive, popular, and less costly is therefore open. This is not the case. The X86 architecture from Intel is precisely as open as an IBM mainframe. Apple, too, will be addressed. 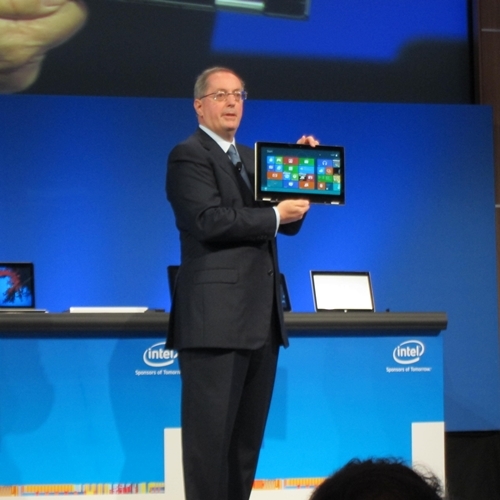 Intel's forthcoming slim Ivy Bridge processors will enable Intel to offer Apple competition in the tablet space and Chipzilla is also planning a massive push around Ultrabooks to give OEMs something to compete with the MacBook Air.